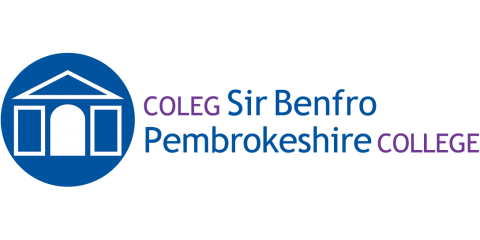 Pembrokeshire College > News > AS Students gain an insight to the world of virtual business. AS Students gain an insight to the world of virtual business. 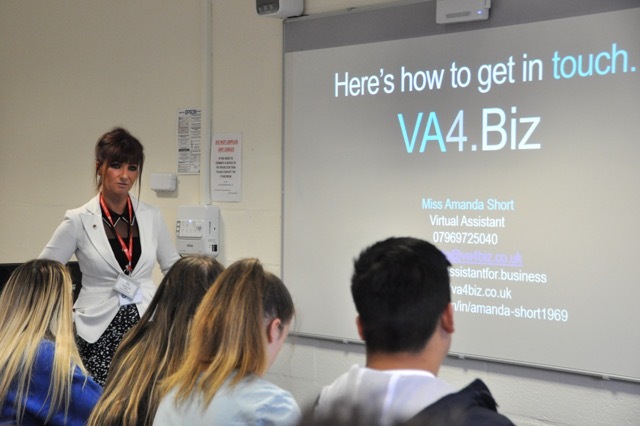 On Wednesday 26th September Disglair+ invited in local entrepreneur, Amanda Short of VA4 Biz (Virtual Assistant for Business) to discuss her experience of being a newly founded business owner with the AS Business students at Pembrokeshire College. The Disglair+ Project is an initiative of events and guest speakers linking learners with role models, experts and inspirational individuals who will encourage students to challenge themselves and foster ambition within the College. With 30 years of experience working in the private and public-sector industries, local entrepreneur Amanda has worked her way up the ladder within various companies such as the Ministry of Defence (MoD), NHS and Ford Dealerships. With extreme passion about her chosen career path and her road to getting to where she is today, Amanda wanted to inspire the students by telling her story. However, her road was not the easiest of routes and life challenged Amanda in more ways than one when she became involved in a serious horse riding accident leading to life threatening injuries. Fortunately, Amanda made a full recovery to the surprise of healthcare professionals, only to later be faced with redundancy in late 2017. Amanda came to the conclusion that job security within the UK was at an all-time low and decided that starting her own business was the way forward. Amanda launched VA4 Biz in January 2018 having noticed a gap in the market in relation to business support. VA4 Biz is a virtual assistant for businesses providing administrative, operational, technical and creative services from a remote location. Amanda explained the benefits of her company, “Virtual Assistants help improve procedures and productivity of business operations, they also allow owners to focus on core aspects of their business and spend more time with loved ones.” Amanda explained her business is growing at a steady rate allowing her to work with a range of diverse clients locally as well as overseas. Amanda passionately discussed her business start-up procedure and support network with the help of the Business Network International (BNI) community who meet at the College on a weekly basis. Amanda outlined that a ‘Virtual Assistant’ is relatively new term used in Wales but is also part of a fast-growing industry. The AS Business students are currently researching the impact new technology has on businesses, particularly the highstreets. Amanda expressed her views and experience of why online is the ‘key marketing tool’ in helping businesses reach and monitor their goals.